Daily Illuminator: Sharpen Your Skullduggery! September 24, 2012: Sharpen Your Skullduggery! Since the dawn of human consciousness, "stealing that which doesn't belong to you" has been an effective path to personal prosperity. 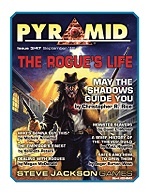 The latest installment of Pyramid looks at both sides of the thievery topic with Pyramid #3/47: The Rogue's Life. In the realm of historic information, we have: a history of the thieves' guild (or lack thereof), as explained by GURPS Low-Tech co-author Matt Riggsby; a look at law enforcement in the Roman Empire by GURPS Ultra-Tech contributor Kenneth Peters; a look at a history of safes and how to open them (including GURPS High-Tech gear that might be of use); and more. For those whose view of thieves veers more fantastic, we present a god of thieves who answers prayers (building off the system from GURPS Powers: Divine Favor), a Dungeon Fantasy-suitable adventurer -- from the quill of David L. Pulver -- who captures monsters with the intent on selling them, and insight on how to keep thieves from harming party unity.